Okay. Wow. This post was supposed to be about how The Man and I will be participating in the Walk of Hope again this year and how you can help. And it still is. But the thing is… we already hit our goal. With eight days left to fund raise, we’ve already reached our goal! How cool is that? I know $110 isn’t going to make or break infertility research and support in this country, but I am beyond proud to know so many good people who want to support something I’m so passionate about. I can’t thank those of you who made donations to Team Hungry For Motherhood enough. Seriously, from the bottom of my heart. But then again, there’s eight days left. Why stop here? How much further can we go? Is it impossible to hope we reach $150? $200? If you’re a regular reader of this blog, you know my story. And with very little effort online, you can find hundreds, maybe thousands, of stories just like mine. We want a child. We start doing what comes naturally. But instead of eventually taking a test and getting a positive result, we see nothing but failure. Month after month, year after year, no baby. We go to doctors. We go to specialists. We cry together as we inject powerful drugs into our bodies to force it to do what should be something so simple that it happens by accident every day for other people. But not for us. Some of us cry in secret. Some of us cry openly. And some of us write blogs about our pain and struggles online. This year, instead of walking hand in hand around National Harbor with nothing but hope in our back pockets, The Man and I will be taking turns carrying our son. And that’s exactly what I prayed for last year when we walked under the balloon arch that marked the beginning of the mile long trek. Please give us a child. Please let our struggle not be in vain. Now that Gibson is here, the time is flying by. Every time I come home from work, he seems a little bit bigger. A little bit older. But when we were trying to conceive, time couldn’t have dragged by more slowly. The two week wait is the longest part of any month for couples who struggle to build their families. Will this be the cycle? Or will this be another month of wasted money, wasted time at the doctor’s office, and hope squandered on a pipe dream? Even though I finally, FINALLY, have the family I have dreamed of, so many other men and women are still trying. Time is still crawling by for them as they look at negative tests over and over again. If you can, please consider giving a donation. Every little bit makes a huge difference. With the money raised, RESOLVE: The National Infertility Association will work to break the silence that surrounds infertility struggles. The organization will put your contribution toward local support groups to help people on the ground dealing with this everyday. They will use your support to lobby at the national level for the rights of people trying to build their family with adoption or infertility treatments. This means tax breaks and mandatory insurance coverage for us all. With your support, you can help someone make their dream of being a parent a reality. I’m so happy these days. I got my wish. My dream came true. But I remember the struggle. And I won’t forget my time in the trenches. 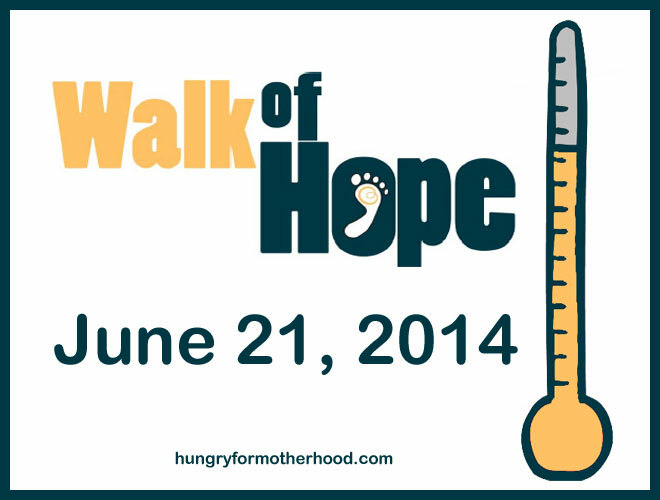 Please support those still pursuing their dreams with a donation to Team Hungry For Motherhood. The video below was posted last September, but I think it really sums up how it feels to go through infertility treatments. The sense of isolation that comes with it. Aisha Tyler is one of my heroes for breaking the silence on national television. Grab some tissues before you press play. I know I cry every time.